Studio: Jacobs/Brown Media Group / Music Video Dist. August, 1965. Ruth Anson, a teenage-reporter for ABC-TV news, is covering the 'teen-beat.' One of her first interviews is with the Beatles, where she asks a young Paul McCartney if he has any plans for marriage. His response: "Only if you'll marry me." Forty years later, Ruth, in search of "closure," obsessively attempts to reconnect with McCartney. "Help" is provided by an opportunist film director who sees Ruth's personal quest as a golden opportunity to reach his professional heights. 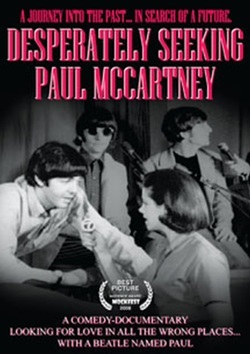 He assigns a camera-crew to follow Ruth as she, in turn, follows McCartney. But it's not long before the director realizes this 'serious documentary' could just turn into a money-pit with limited marketability. And then he has a brainstorm: in the spirit of reality TV, he manipulates his production to become more entertaining ... and far more embarrassing for the unsuspecting Ruth. This politically incorrect comedy series, presented in half hour episodes lampooning network television, was a cult hit when aired in numerous U.S. markets in 1986 (as "Channel K") and 1987 (as "Son of Channel K"). Popular recurring segments were "The Handy Dan Show," about a not-so-handy do-it-yourselfer, "Bikini Beat," about a cop in a bikini whose "turf is the surf," "Too Hip," following the misadventures of "odd-couple" Siamese twins - one neat, one sloppy - joined at the hip and working as police detectives, and "Bachelor Pad," where Chad Randolph, guru to the single dude, gave "tips on scorin' chicks." Released for the first time on DVD, this disk includes the premiere episode of "Channel K," the final episode of "Son of Channel K," and episode #3 of "Bachelor Pad." Bonus features include "History of Channel K" and photo gallery.